Theorists have provided an explanation for experimental quantum-mechanical findings that have puzzled researchers for years, opening new possibilities for studying and manipulating ultracold atoms in lattices. JQI Fellow Charles Clark and Ippei Danshita of the Tokyo University of Science set out to create a mathematical simulation, derived from quantum-mechanical first principles, of an experiment conducted in 2005 (see first reference publication). 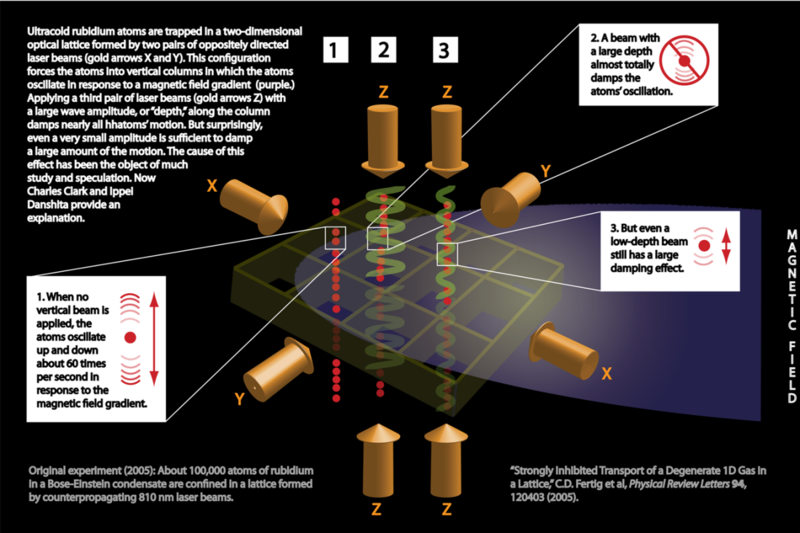 That experiment, by a team including JQI Fellows Steve Rolston, William Phillips and Trey Porto, cooled a population of about 100,000 rubidium atoms into a Bose-Einstein condensate (BEC) – a condition in which each atom has the same quantum properties and the entire ensemble coalesces into the equivalent of a single “superatom.” One of the hallmarks of a BEC is superfluidity, or frictionless flow of matter, in which energy is not dissipated by the motion of the atoms. The experimenters then confined the BEC atoms in a two-dimensional lattice formed by two pairs of counter-propagating laser beams of 810 nm wavelength, at right angles to one another. This forced the atoms into thin columns perpendicular to the plane of the 2D lattice. The ensemble was then exposed to a weak magnetic field gradient, and the atoms responded by oscillating vertically about 60 times per second. This "dipole" motion was expected. What the scientists did not expect was the sequence of effects produced by adding a third pair of laser beams along the same axis as the atom columns and varying the beams' wave amplitude. Very small amplitudes ( or "lattice depth") barely affected the atoms' vertical motion. Large lattice depth almost completely suppressed oscillations, a condition termed "overdamping.". And surprisingly, a beam with very small amplitude/lattice depth (sufficient to produce only a 6% change in atom density in the columns) inhibited most of the motion. Physicists are always extremely interested in such transition points, at which the conditions of a system change substantially, because they can reveal underlying processes. The researchers noted at the time that there was no theoretical framework that would fully explain the cause of the transition to overdamping. Clark and Danshita have now devised a simulation (see second reference publication) that agrees quantitatively with all the measurements in the 2005 paper. Their model attributes the damping effect to quantum fluctuations unique to 1D systems that cause the gradual decay of superfluid motion. As an increasingly large fraction of the atoms goes from the superfluid to energy-dissipating (non-BEC) state, atomic motion decreases accordingly. "Our results show that in the NIST experiment quantum fluctuations affect drastically the macroscopic properties of the system, such as the transport," Danshita says. "We feel that this interpretation has a large potential impact, because it clearly indicates that it is now possible to experimentally study macroscopic quantum phenomena of the second kind, including macroscopic quantum tunneling, in systems of ultracold atoms loaded into optical lattices." The research was supported by the National Science Foundation through the Physics Frontier Center at the JQI.